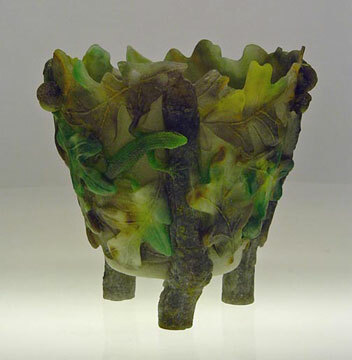 For a brief history of pate de verre and kiln casting, click here. 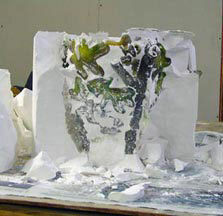 Pate de verre, the technique of pressing glass powders or frits into a mold, is a detailed and difficult form of kiln casting. 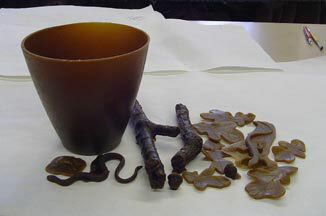 However, it is the use of these fine frits that give pate de verre its distinctive luster and allows for specific placement of colors in the mold. Pate de verre utilizes the 'lost wax' casting method that other art objects are made of, from bronze sculpture to gold and silver jewelry. Each piece starts with a wax model. The model can be an original carving or a duplicate made from a reproduction mold that is poured around the original carving. A model is an exact replica of the finished piece and every model starts with an idea. Once I have a picture in my mind, I gather my design elements. 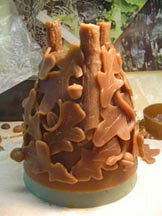 The next step is to make molds and patterns from the various elements and then, wax reproductions. Once all my pieces are ready, I arrange and re-arrange until I have a composition that I am satisfied with. After the rough composition is done, I permanently attach the elements to the vase and then start filling in all the open and void spaces. When I have determined that all the holes are filled and everything is attached, I start to refine, sculpt, and clean up the shapes and forms. Last of all, the small detail is added, in this case, the veins on the leaves. 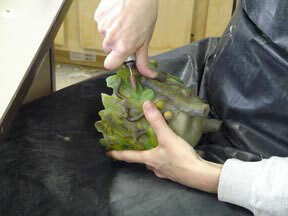 Before the mold can be made, the entire model is smoothed. When the model is ready, it is glued down onto the mold jig and a sheet metal dam is wrapped around it. Marc mixes the mold formula and pours the investment material over the model. When the investment is set, the dam is removed. 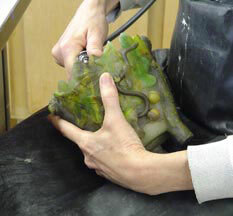 The wax model is then steamed out of the mold, hence the term 'lost wax'. At this point the model is gone forever and the outside mold is ready. The second piece of the mold, the core, is poured in a similiar fashion using the core jig. After the mold is completed it is inspected and cleaned up. Some small details are carved directly into the mold. 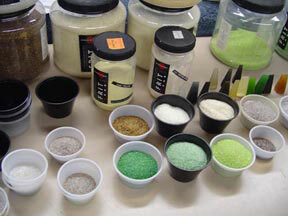 The volume of glass required to fill the mold is calculated and the colors are selected and weighed out into appropriate amounts. Frit is mixed with gum arabic to form a sort of paste and the colors are placed selectively into the mold with small spoons, scoops, and spatulas. After all the glass has been placed in the mold, the core is set on top and it is set in the kiln and slowly brought up to casting temperature - 1400 - 1550 degrees where it 'cooks' until the glass has cast. When the casting has finished, it is reduced to the annealing temperature where it must rest awhile. 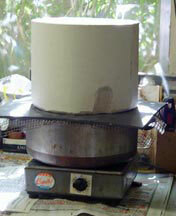 Finally the kiln is slowly cooled over a period of many hours or days - the larger the piece, the longer it takes. 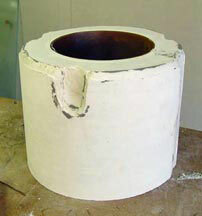 If the kiln is cooled down too rapidly, the piece will crack. 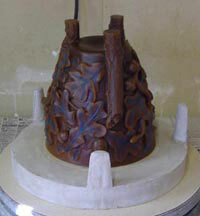 When it is completely cool, it is removed from the kiln and the mold is broken away. 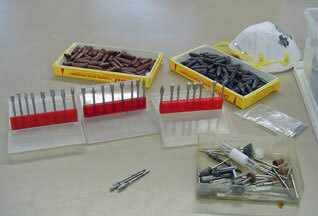 Once all the mold material is removed, the piece is cleaned. The amount of cold work required varies with the piece and depends on how well it cast among other considerations. This piece required quite a lot of cold work, grinding the rim down, using diamond bits and polishing bullets, to convolute around the design to conform to the original vision of the piece.